We were bowled over by the latest exhibition to open in Skibbereen on Saturday: West Cork Creates. 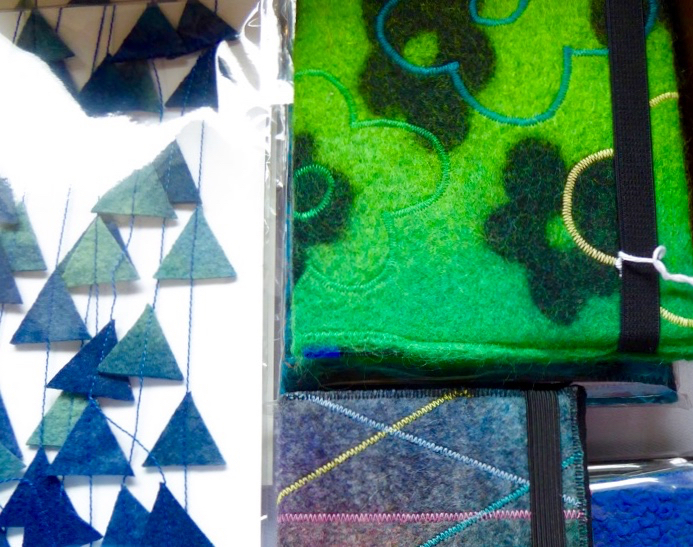 It shows collaborations between local craftspeople, visual artists, photographers and designers – combining their skills and expertise to produce exciting, original work. Grayson Perry makes pots, so is he an artist? Well, presumably the British art establishment thought so as they gave him the Turner Prize in 2003, the first time it had gone to a ‘ceramic artist’. Where does that leave us? Is someone who makes flowerpots an artist, because a flowerpot might be an attractive object? 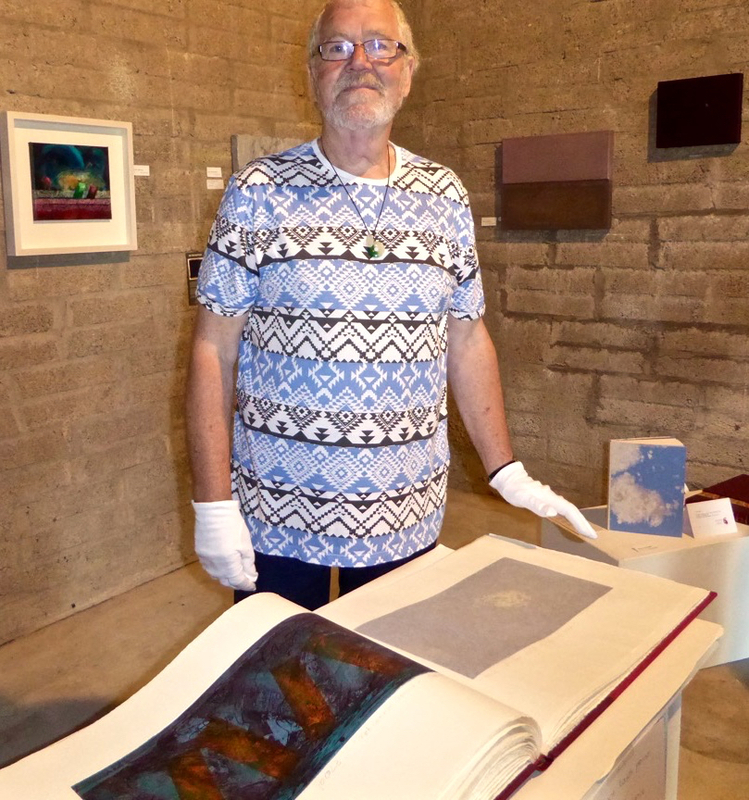 Where do you place something like the Book of Kells? It’s a functional object – the four Gospels lavishly illuminated – created in medieval times by many different hands. Yet it’s unique, overflowing with stunning visual images, beautiful and priceless. It’s a wonderful example of collaboration between the functional craft of the scribes who penned the texts and the minds of the (undoubted) artists who produced the decorations around those texts: perhaps they were the same hands. What about Finola’s subject for today, Harry Clarke – artist or craftsman? Stained glass is not ostensibly functional (except, perhaps to change the quality of the light coming through a window) yet the making of it is a craft requiring a lengthy apprenticeship and a garnered knowledge of specific materials and their use. I have no doubts: walk into St Barrahane’s Church, Castletownshend, and be dazzled by the Clarke windows there. They are inspired: true art. Harry Clarke designed and made these windows, so he was artist and craftsman rolled into one. For me West Cork Creates (part of the Taste of West Cork Food Festival) demonstrates conclusively that you can’t differentiate between art and crafts. 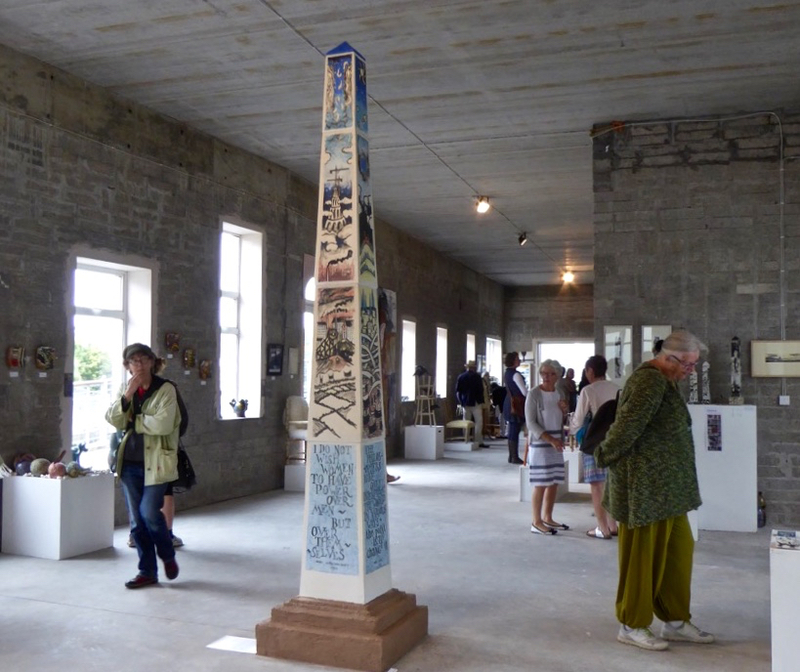 As you enter the gallery you are immediately presented with an iconic piece – The Great West Cork Obelisk – which stands almost three metres high. It is a collaboration between two minds and two sets of hands: Brian Lalor and Jim Turner. Brian we have met before in the pages of our blog: he is a true polymath. He writes (prolifically), he produces art (prolifically), he has been an architect and an archaeologist. Jim is a ceramic sculptor of renown. Egyptian ‘obelisks’ are commemorative monuments of the Pharaohs and they usually carry a lengthy inscription praising the deeds of some significant individual. This one is constructed from four terracotta sections made by Jim in his Clonakilty studio and fired in a specially constructed kiln. The base inscriptions are all quotations, two from social philosophers and two from writers, all concerned with the state of society. Brian’s images derive from these, from the contemporary world and from the local environment. The artists’ statement says: Obelisks may be the new round towers of the landscape… (remember that Brian has written the standard work on Ireland’s medieval round towers). I agree: I’d love to see this work prominently displayed in a public place locally – and many more like it. The obelisk absorbed our attention for a good half an hour, delaying us from moving on to the rest of the exhibition: it’s a show stopper! There are chairs and stools: functional objects to be sat upon. But you’d think twice about sitting on these. 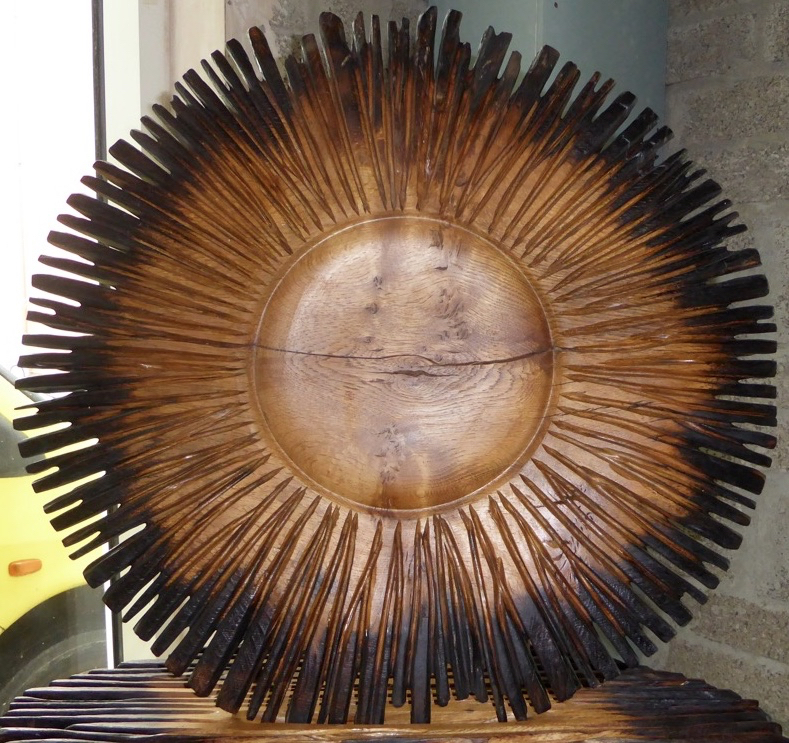 They are initially examples of the work of Alison Ospina who uses coppiced hazel to make distinctive seating, but they have been transformed by others (painter, sculptor and felt maker) into works of art which will primarily be looked at and appreciated. There are thirteen collaborations in the exhibition including stone sculptor and furniture maker; metal sculpture and photography; basketmaker and visual artist; painter and felt maker; painter and boatbuilder; cutler and jeweller, all based or working within West Cork… This is just a taster – we have to go back and catch up on the other genres and artists and perhaps write a further blog post. The exhibition runs for five weeks from 8 August to 10 September at Levis’s Quay in the centre of Skibbereen, and is open from Mondays to Saturdays between 11am and 6pm. Be sure to get there – you won’t be disappointed: watch out for the gallery talks, too. Once you have seen the exhibition, you might like to comment and add your contribution to the artist / craftsperson debate. This entry was posted in Irish Art, Irish Culture, Skibbereen, West Cork, West Cork Blog and tagged Alison Ospina, Book of Kells, Brian Lalor, Coilin Murray, Dee Forbes, Etain Hickey, Grayson Perry, Harry Clarke, Helen Walsh, Jim Turner, Rohan Reilly, The Great West Cork Obelisk, West Cork Creates. Bookmark the permalink. This looks a fascinating exhibition and it seems to be in the perfect space too. I’m not getting into this art v craft argument, I’m sure I had to write an essay on it once and there is no answer! It’s well worth a visit, Amanda. There’s some good comments on the debate below! This looks like a great exhibition + wish we could be there to see it. I like ravens on stools + the obelisks with quotations. The obelisk quotations hint at an answer by mention of philosophers + pedants. I wish you were here to share the exhibition too, Chris – you know you are always welcome! Thank you, Jens, those are good thoughts. I think the distinction must lie somewhere between whether an object is useful rather than beautiful: Of course, it could (and should) be both! Again a very interesting topic, Robert! A thought that came to my mind: Art is unique, Craft is reproduced. But it is not as simple as that – isn’t it. In almost every piece of Art one can see revival of another one. And almost every handmade piece of craft may be called unique. My conclusion would be: It lies in the eyes of the beholder to distinguish between something that is art to him and another that isn’t. Or one may decide it is both together.